The Bible tells us many things about God which we cannot explain or understand; yet we know they are true because God says so. From the Bible we learn that there is only one living and true God; yet He exists in three Persons—Father, Son, and Holy Spirit. God the Father is in Heaven "dwelling in light which no man can approach unto; whom no man has seen, nor can see…" (1 Timothy 6:16). God the Son is the Lord Jesus, whom the Father sent into the world to be our Savior. "…The Father sent the Son to be the Savior of the world" (1 John 4:14). God the Holy Spirit is "the Spirit of truth"—the One who teaches us the truth about God, Satan, and ourselves. 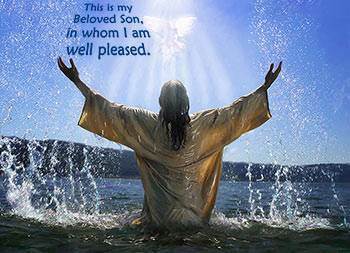 An amazing thing happened when Jesus was baptized—all three Persons of the Godhead were manifested. 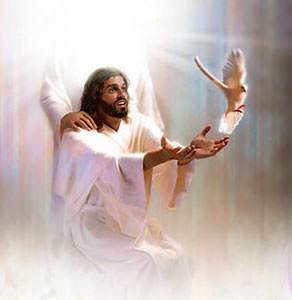 As Jesus, the Son, came up out of the water, the heavens were opened, and the Holy Spirit came down like a dove, lighting on Him, and the Father spoke from Heaven, saying, "This is My beloved Son, in whom I am well pleased" (Matthew 3:16-17). This means that God always does what is right. God has His way of doing things, and His way is righteousness. The Bible says, "The Lord is righteous in all His ways and holy in all His works" (Psalm 145:17). Because God is righteous, He punishes all sin. God cannot overlook our sins or pretend that He does not know about them. But God has made a way for us to be forgiven of all our sins. He sent His Son, the Lord Jesus to take the punishment for our sins. Because Jesus paid the full penalty of our sins, God is perfectly righteous when He forgives the sins of those who take Jesus as their Savior. The Bible says, "…through His name whoever believes in Him [the Lord Jesus] shall receive remission [forgiveness] of sins" (Acts 10:43). This means that God always does what He says He will do. He always keeps His word and His promises. He is always faithful and dependable. The Bible says, "Know therefore that the Lord your God, He is God, the faithful God, which keeps covenant [His word] and mercy with those who love Him and keep His commandments…" (Deuteronomy 7:9). God keeps every promise that He makes. He is "the God of truth," and He cannot lie. He has promised eternal life to all who believe on His Son and receive Him as Savior and Lord. God not only saves us, but He also keeps us. The Bible says, "The Lord is faithful, who shall establish you, and keep you from evil" (2 Thessalonians 3:3). This means that God is always merciful and kind. He always does what is best for us. The Bible says, "O give thanks unto the Lord; for He is good; for His mercy endures forever" (Psalm 136:1). God is good to all, even to those who do not believe in Him and those who hate Him. The Bible says, "…He makes His sun to rise on the evil and on the good, and sends rain on the just [the believers] and on the unjust [unbelievers]" (Matthew 5:45). God loves all people, but He takes special pleasure in those who have trusted the Lord Jesus as their Savior. Every believer can say, "I am a delight to God because I love Him and I have taken His Son as my Savior and Lord." The Bible says, "Oh how great is Your goodness, which You have laid up…for them that trust in You before the sons of men" (Psalm 31:19). This means that God is good and kind, gracious and forgiving to those who deserve only punishment. Jesus showed us God's boundless mercy when He was crucified. On the cross, He asked the Father to forgive the ones who crucified Him. He said, "Father, forgive them, for they know not what they do" (Luke 23:24). The apostle Paul, before he was saved, was a very religious man, but he was also very wicked. He hated Jesus and he hated all those who believed in Jesus. He went about killing Christians and dragging them out of their homes and throwing them into prison. But Jesus loved Paul and had a great plan for his life. The Lord Jesus showed His great mercy in saving Paul and calling him to serve Him. Paul never got over the mercy and grace which the Lord showed to him. Paul wrote, "I thank Jesus our Lord, who…counted me faithful, putting me into the ministry; who was before a blasphemer, and a persecutor, and injurious: but I obtained mercy…and the grace of our Lord was exceeding abundant…" (1 Timothy 1:12-14). We know because God says so. In His Word God says, "I have loved you with an everlasting love…" (Jeremiah 31:3). We know because God gave His only Son to die on the cross for us. The Bible says, "God commends [shows] His love toward us, in that, while we were yet sinners, Christ died for us" (Romans 5:8). God is saying to us, "How can you doubt My love for you when you see My beloved Son suffering and dying on the cross for you?" God's glory is so bright that we could not bear to look at Him, even for a moment. We cannot bear to look at the sun when it is shining brightly. If we were to look at it very long, we would lose our sight. God's glory is much brighter than the noonday sun. This is why we cannot look on Him. The Bible tells about a man named Moses, who was a special friend of God. He talked with God, and God talked with him many times. But Moses never saw God. One day Moses begged God to show him His glory. The Lord said, "You cannot see My face: for there shall no man see Me, and live." The Lord told Moses that He would make a place for him. God hid Moses in the cleft of a rock. As He passed by Moses, the Lord proclaimed, "The Lord, the Lord God, merciful and gracious, longsuffering, and abundant in goodness and truth…" (Exodus 34:6). Moses saw a little bit of God's glory and it made his face shine so brightly that he had to wear a veil over his face for a time. It is no wonder that Moses and the people said of God, "Who is like unto You, O Lord…glorious in holiness, fearful in praises, doing wonders?" (Exodus 15:11). Did you know that God has actually been here on the earth? 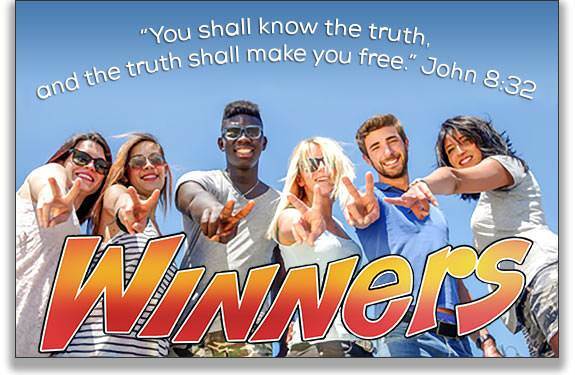 The Bible says, "…great is the mystery of godliness: God was manifest in the flesh…" (1 Timothy 3:16). The Lord Jesus, God the Son, came into the world as a tiny baby. He grew up and lived here for 33 years. One reason God sent His Son into the world is that we might know what God is really like. People have all kinds of wrong ideas about God, put into their minds by Satan. Jesus came to tell us and show us what God is really like. The Bible says, "No man has seen God at any time; the only begotten Son [who is Himself God], He has declared Him [shown us what God is really like]" (John 1:18). What is God like? He is just like Jesus! 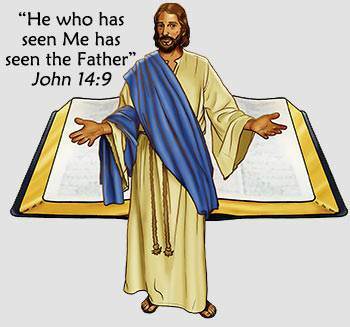 Jesus said, "…he who has seen Me has seen the Father…" (John 14:9), and "I and my Father are one" (John 18:30). If we truly love God, we will want to please Him. In His Word, God has told us what pleases Him. God is pleased when we trust Him. The Bible says, "The Lord takes pleasure in them that fear Him, in those who hope in His mercy [who expect Him to be loving and kind]" (Psalm 147:11). God is pleased when we obey Him. The Bible says, "This is the love of God, that we keep His commandments: and His commandments are not grievous" (1 John 5:3). God is pleased when we choose to love Him. God says, "Because he has set his love upon Me, therefore will I deliver him: I will set him on high, because he has known My name. He shall call upon Me, and I will answer him; I will be with him in trouble; I will deliver him, and honor him. With long life will I satisfy him, and show him My salvation" (Psalm 91:14-16). God is pleased when we delight in His Son. All of God's delight now rests on His beloved Son. God is pleased when we love Christ and delight ourselves in Him. The Bible says, "Delight yourself also in the Lord; and He shall give you the desires of your heart" (Psalm 37:4). God is pleased when we thank Him. We are to thank God in everything! This shows that we are trusting in God's faithfulness and His goodness. The Bible says, "In everything give thanks: for this is the will of God in Christ Jesus concerning you" (1 Thessalonians 5:18). God is pleased when we praise Him. Praise means that I am overflowing in my joy and satisfaction in God. The Bible says, "By Him [Jesus] therefore let us offer the sacrifice of praise to God continually…for with such sacrifices God is well pleased" (Hebrews 13:15-16). There is only one true and living God: yet He exists in three Persons—Father, Son, and Holy Spirit. Because Jesus paid the full penalty of our sins, God is perfectly righteous in forgiving the sins of those who take Him as their Savior. 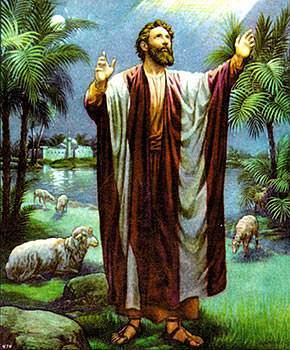 Abram, whose name God later changed to Abraham, occupies a unique place of prominence in Scripture which no other person has. The Bible says that he is "the father of all them that believe." "Get out of your country, and from your kindred, and from your father's house, unto a land that I will show you. 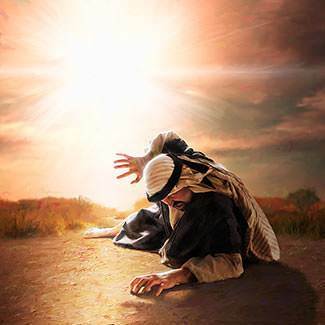 Abram is the first example of a man chosen and called by God. The call of God is a wonderful thing. The mighty and powerful voice of God from the unseen spiritual world reaches our heart. It awakens us to the consciousness that God is calling us to live for Him and to do a work for Him. Like Abram, we too have heard the mighty voice of God from the unseen world. Like Abram, God calls us to be "strangers and pilgrims" in this world. God promised to make the descendants of Abram a great nation. God said, "I will make you a great nation; I will bless you and make your name great." 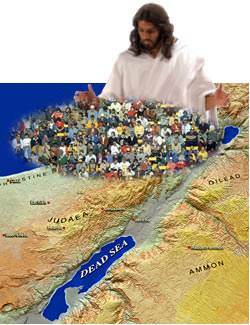 The great nation which came from Abram is Israel, God's special, chosen people here on earth. God said to Abram, "In you shall all families of the earth be blessed." Later, God spoke to him and said, "In your seed [one person, Christ] shall all the nations of the earth be blessed." This was the greatest honor of all—that from Abraham's family, his descendants, would come the promised Savior. When we open the New Testament, the first words we read are these: "The book of the generation of Jesus Christ, the son [descendant] of David, the son [descendant] of Abraham" (Matthew 1:1).